Made of natural woven split wood, this large rectangular laundry ham per will work well in any bathroom decor scheme and is warm and tactile. Lining 100 per cent Polyester. Ooh thanks I'll have a look at the weekend! My bottom has fallen off mine!!! Heat! These are not so great after a while. The lack of a handle means that if you carry this around, you'll eventually break the woven wood on the sides. The fabric will eventually get smelly too from the dirty clothes. All said and done, at the discounted price it's a decent product. These are not so great after a while. The lack of a handle means that if … These are not so great after a while. 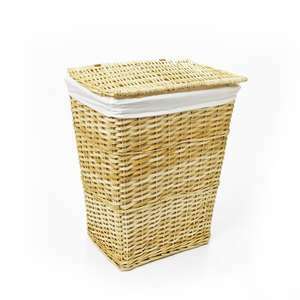 The lack of a handle means that if you carry this around, you'll eventually break the woven wood on the sides. The fabric will eventually get smelly too from the dirty clothes. All said and done, at the discounted price it's a decent product. If you WASHED the inner lining regularly it wouldn't get smelly... However, you're right about the handle thing. I don't think these are very big for washing baskets. If you WASHED the inner lining regularly it wouldn't get smelly... … If you WASHED the inner lining regularly it wouldn't get smelly... However, you're right about the handle thing. I never thought of that!!! Thanks for the suggestion. And yes, I'm as stupid as I sound. How do you wash the lining if it is sewn to the woven inside? OOS takes you all the way to the payment section before it tell you. Ooh thanks I'll have a look at the weekend! My bottom has fallen off … Ooh thanks I'll have a look at the weekend! My bottom has fallen off mine!!! Heat! Never saw the point of a laundry basket - I just use the washing machine itself.